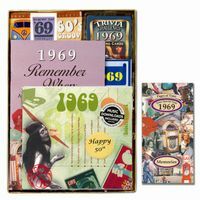 Personalized 50th Anniversary Time Capsule for 1969. If you are looking for a 50th anniversary present, look no more! This time capsule box is full of gifts for the year! and a year you were married card. You can even personalize this 50th anniversary time capsule by entering a 50 character message in the box below. Your personalized message will appear on a gold seal that we will place on the lid of the box. It comes packaged with gold and white shred in a 10" long x 7" wide x 1.5" deep gold stationery box with a clear top. What a dazzling 50th anniversary present! See also our other gifts for a 50th wedding anniversary. What WE say about our time capsule: Everyone is worried about spending too much for gifts these days. Not everyone can affort a 50th anniversary gift basket, so SeniorStore.com created this custom gift as a less expensive but still classy 50th anniversary gift alternative. 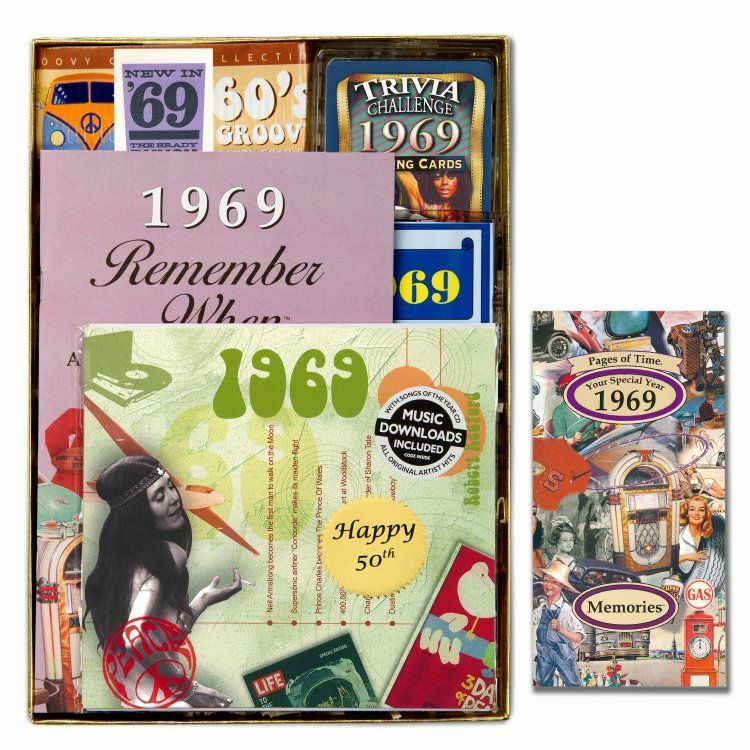 We've taken the most popular gifts from the gift basket and assembled them into this attractive personalized time capsule. You'll get the candy sweets, the music CD, so you can all dance at the party together, and a sampling of trivia for the nostalgia buffs attending the big event. One of the first things everyone does is look at the retro prices in the trivia booklet to see what things cost "back in the day." The cool thing about this 50th anniversary present is that the personalization for this time capsule is INCLUDED with the price of the gift! Can't beat a freebie!! Our aunt and uncle called this 50th anniversary gift from us special, awesome, and thoughtful, like a "way-back machine." They had so much fun reading everything and loved the candy. I'll give this again for upcoming 50th anniversaries! This was very enthusiastically received! Sent to my brother and sister-in-law for their 50th anniversary. They sFound it to be very unique and full of surprises. They had days of enjoyment from it. Just the right price and so personalized for the couple. Gift wrapping was beautiful. Thank you . You did a great job. I am sure that the 50th anniv. box will definitely be enjoyed by the anniversary couple.
. I am having my 5oth anniv. in august. It is something that I definitely would enjoy receiving as a gift , I am sure our friends will love it. I have your site bookmarked and will most likely be ordering from you again,. It is nice not worrying if the gift will get here in time,.